This is a third article regarding the productsof Scibor Monstrous Miniatures (check previous texts) and we decided to focus on vehicles and vehicle decorations this time. Those accessories were also used in an attempt to restore a heavily damaged Land Raider model from the Warhammer 40,000 game. Unfortunately, so far Scibor does not offer many vehicles. I really hope that one day this will change. 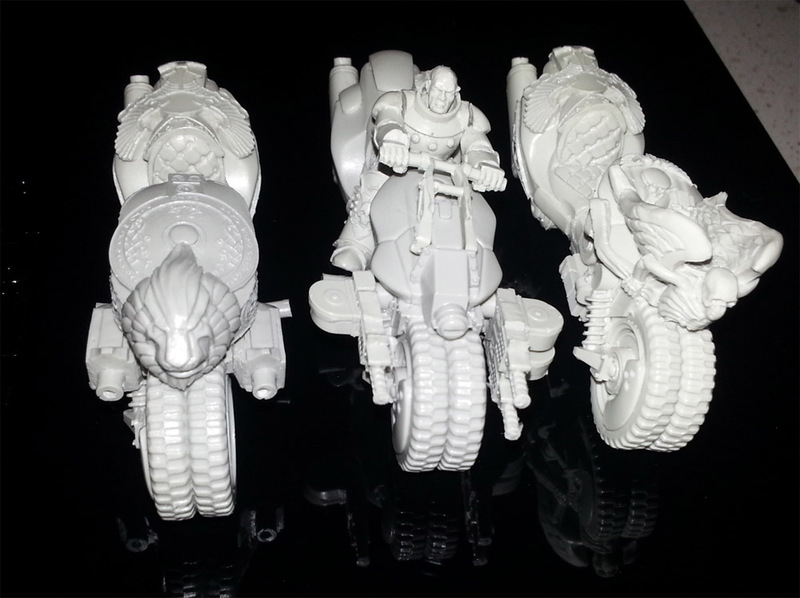 For now, however, there are three models of motorcycles and three mechs (I will discuss them in the next review). All motorcycles, as you can guess, are obviously in the 28mm SF Miniatures section. The First vehicle was simply called SF Motorcycle and it was and still is the simplest version of the motorcycle offered by this shop. It was first such model made by Scibor Teleszyński, and perhaps for this reason its structure is quite simple. 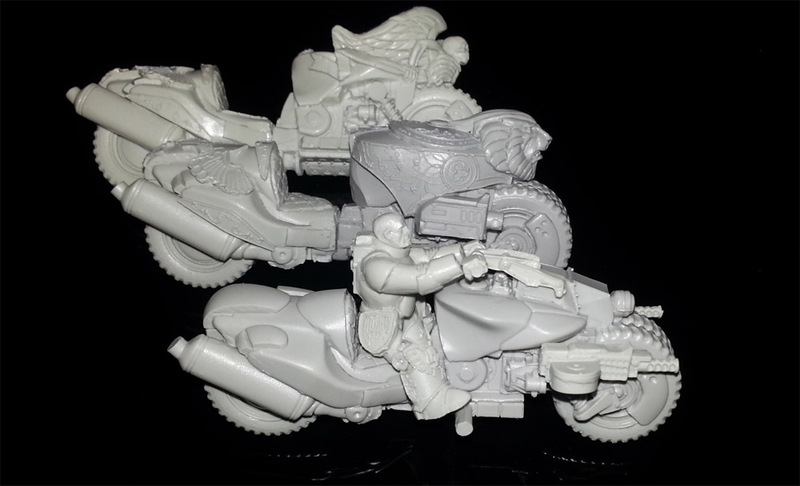 The first thing that strikes you when you see theg model is its size, all three bikes are much larger and more complex than those produced by Games Workshop. Scibors model is also clearly futuristic, low and somewhat aerodynamic. The front of the vehicle is low and has a slightly strange-looking reflector. In some places you can see the gears and engine components, and the front of the motorcycle is equipped with twin machine guns with, horizontally placed magazines (slightly similar to the US First World War Lewis Gun or Russian DP-28 used in Second World War). One of the most interesting items is the tires that look like one thick tire composed of two narrower ones. The second motorcycle that was available for sale is Angel Knight Motorcycle. This is essentially the same design as before, but with some fundamental differences. This time the vehicle is decorated with various ornaments, reliefs, eagles and crests. The biggest change is the skeleton with angel wings on the front of the bike, which dramatically changes the appearance of the model. The Weapons are the same as in the previous model. This time, however, the driver is equipped with a sword and dressed in different clothes. It is worth mentioning that the fuel tank is decorated with an eagle sculpture and has an electronic dashboard placed below. 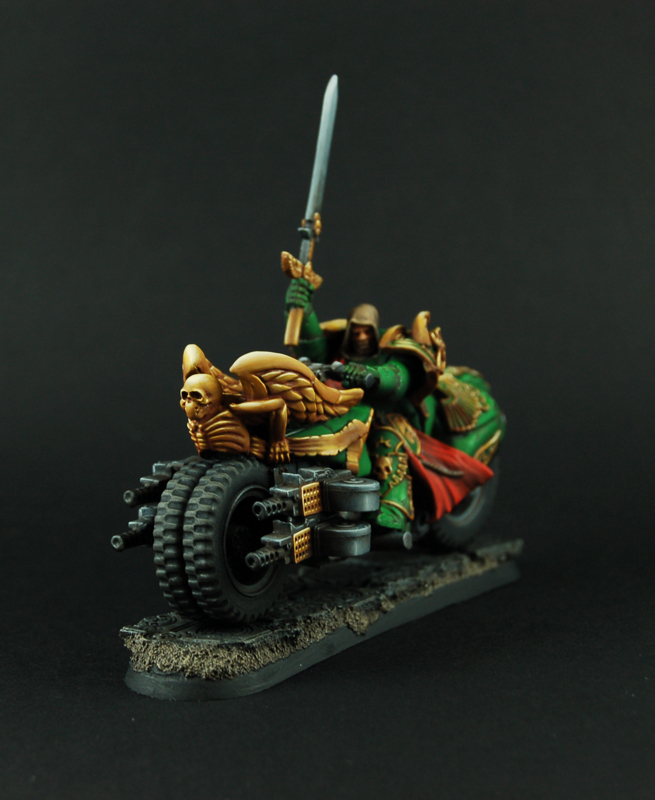 The third of the vehicles, which is the latest addition to the offer, is the Lion Knight Motorcycle, our favorite. It is obvious that the author had already established a pattern and began to improve it and experiment with the design. As you can guess, this model has been adapted to the design of Lion Knights figures. The rear part has remained the same as in the Angel Knight Motorcycle, but the front has been subjected to significant changes. This time, the front top of the model is decorated with a lion's head, and the fuel tank feels more “solid” and is almost entirely decorated with reliefs. The fuel tank tap is surrounded by a circular decoration, below there is the dashboard, this time in the form of standard analog speed indicators (much better than the digital ones). The weapon has been changed to guns resembling bolters (in our opinion, a much better pattern). This time, the driver is a Lion Knight armed with a spear. All three models have the same base decorative tiles which are “damaged”. Because not all the pieces fit perfectly, you will need to be prepared to fill in the gaps with green stuff. The Overall quality is very good and I did not notice any major errors, air bubbles nor other similar defects. The only thing I can point out is the lack of holes in the bolters' barrels. I would also like to discuss the custom vehicle ornamentations and decorations that are available from Scibor’s store. Some of them almost perfectly match the Land Raider tank from Warhammer 40,000. There are a few sets of these ornaments and they focus on the main themes: angels, death, knights, wolves and lions, but there are also decorations inspired by Celtic and Egyptian art. 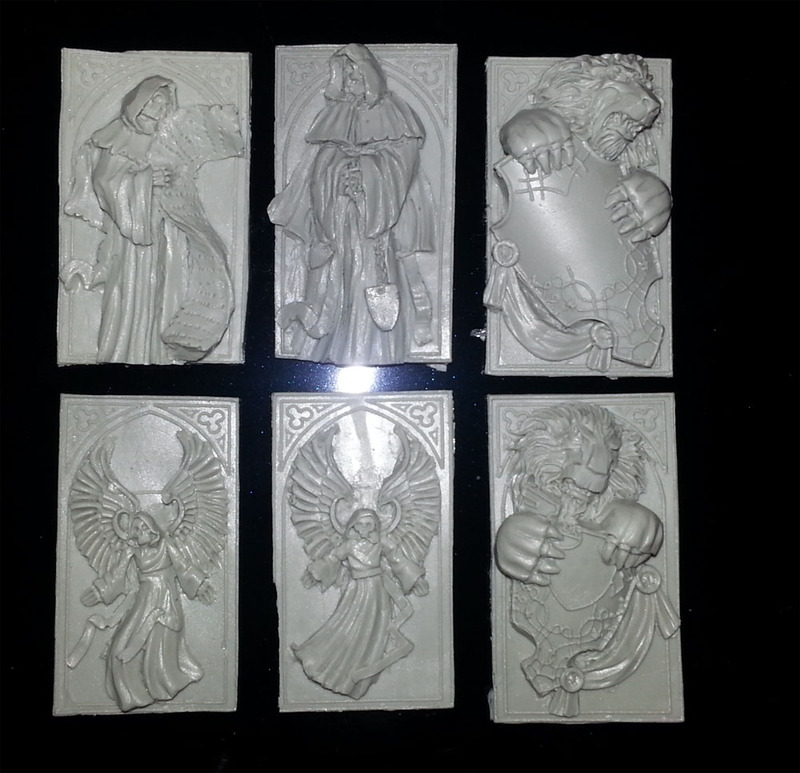 I think the best option is to purchase Angels Big Conversion set, containing a few almost ready-to-use components. The largest of these is suitable for the side walls of the Land Raider model, while the others are a fit for the various slots in the vehicle armor. However, these decorations have many more possible uses. They can be used for a variety of vehicles, tanks, air ships and even buildings. It would be difficult to describe all the accessories here, because it is a whole, separate section in the store: Decorated Plates. Certainly they are worth the attention and can really add some distinction and diversity to your models and fortifications. I’m positive that everyone will find a use for them in their own collection. I earlier mentioned the use of accessories from Scibor Monstrous Miniatures in the restoration of the old Land Raider model. The vehicle was badly damaged and I bought it for a very low price. Both the roof and part of the side walls were distorted and broken. It also lacked some of the basic elements that have been replaced by some clumsy green stuff work. I had three options to choose from: make this model a wreck for a mock-up, convert it to Chaos (Nurgle) Land Raider, or try to fix it somehow with ornaments from Scibor offer. I chose the last option. The work is far from complete, but I already see significant improvement and opportunities for final success. Damage to the side walls is practically invisible, I also was able to hide the majority of the roof deformations. Of course, not all of the ornaments fit perfectly. You have to be prepared for slight modifications of the model, I had to trim several elements, and after the installation of accessories I needed to fill the cracks and gaps with green stuff. It will take time, but I believe that the final result will be satisfactory. At the end we would like to express our sincere hope that Scibor’s offer will be expanded by more machines, tanks, or some flying vehicles. I know Mr. Scibor Teleszyński worked with a design for an air speeder, I hope that he will finish this project one day. Frankly, all of the editors (including me) would really want to see a Scibor’s version of a Thunderhawk or Land Raider kind of vehicles. Dla mnie motorki są za duże i za drogie. Jakbym chciał zrbić odział, to muszę zapłacić kilka stówek i do tego jeszcze średnio nadają się wielkością do Warhammca, a szkoda. Ozdóbki i pierdółki to co innego, całkiem fajna sprawa. Wooo spaceship or something bigger than bike! I bet Scibor vehicle would be great. The clearness in your post is simply great and i can assume you're an expert on this subject. Fine with your permission let me to grab your RSS feed to keep up to date with forthcoming post. Thanks a million and please carry on the gratifying work. all at alone place. link, http://www.